The majority of symptomatic rotator cuff disease patients respond to a nonoperative program emphasizing the restoration of normal biomechanics, unrestricted motion, and functional force couples. Early surgical management should be considered for acute rotator cuff tears in physiologically young and very active individuals. The ability to recognize the complex layered anatomy in addition to the tear configuration is critical if an anatomic repair is to be achieved. The rotator cuff muscles centralize the humeral head and permit a single center of rotation while providing stability and strength. During active shoulder elevation, the rotator cuff muscles depress the humeral head, allowing efficient elevation of the extremity. When surgery is necessary, the goal should be to properly and anatomically restore the balanced forces of the supraspinatus and deltoid muscles so that their counteraction is maintained. Tearing of the rotator cuff as a function of age is a common occurrence. Many of these tears may be clinically silent. Mechanical impingement is the most common recognizable source of recurring rotator cuff pain and disability in the active population. When impingement-type symptoms present in a younger patient, great care must be taken to avoid overtreating because the impingement may be internal or may be secondary to instability which effectively moves the cuff closer to the arch. The unaffected shoulder can serve as a “normal” template for comparison during physical examination. One should survey for atrophy or asymmetry, especially in the supra- and infraspinatus fossae. Long-standing rotator cuff tears are often accompanied by significant, visible atrophy. The initial evaluation of the painful shoulder should include quality plain radiographs. The standard radiographs should include a true anterior-posterior view with the shoulder in the internal and neutral position, an axillary view and the outlet (supraspinatus) view described by Neer and Poppen which is used to evaluate and classify acromial morphology and arch anatomy. Magnetic resonance imaging (MRI) is the test of choice when evaluating the soft tissues of the shoulder. T1 weighted images revealing increased signal in the rotator cuff, combined with a focal defect or loss of continuity of the cuff on the T2 weighted image, is a common finding when a full or partial-thickness tear is encountered. MRI scans for those anticipating shoulder surgery can be helpful in evaluating tears, assessing possible atrophy, and establishing the presence of co-morbidities. Injuries to the rotator cuff occur commonly. Treatment for these common disorders is most effective when a management algorithm can be developed based on a keen understanding of pertinent anatomy, pathology, and outcomes studies supporting specific treatment. Suffice to say that the majority of patients with symptomatic rotator cuff disease respond to a well-planned, nonoperative program emphasizing the restoration of normal biomechanics, unrestricted motion, and functional force couples. Clearly there will be those patients in whom the pathology has progressed to a point where surgical intervention may be appropriate. 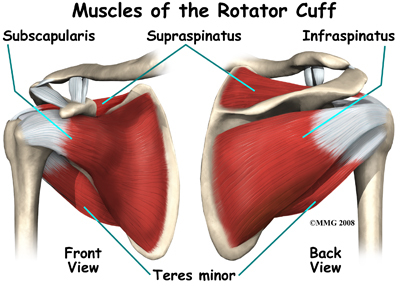 The rotator cuff consists of the supraspinatus, infraspinatus, teres minor, and subscapularis muscles, all of which arise from the scapula and insert into the proximal humerus. The subscapularis muscle is innervated by the upper and lower scapular nerves, and arises from the anterior surface of the scapula, inserting into the lesser tuberosity. The nerve supply to the supraspinatus is provided by the suprascapular nerve, and the muscle originates from the supraspinatus fossa, inserting into the greater tuberosity. The infraspinatus muscle is also innervated by the suprascapular nerve after it passes around the spinoglenoid notch. The muscle arises from the infraspinatus fossa and inserts into the posterolateral aspect of the greater tuberosity. The axillary nerve innervates the teres minor, which originates from the inferior and lateral aspect of the scapula, inserting into the inferior portion of the greater tuberosity. Another important and under appreciated feature of the rotator cuff is its distinct layered makeup . The first layer is a superficial one extending from the coracoid process to the greater tuberosity following the course of the coracohumeral ligament. The second layer consists of the supraspinatus and infraspinatus tendinous fibers. Layer three is composed of the same muscle groups, but the fibers are oriented obliquely and interconnect with the adjacent rotator cuff fibers including the subscapularis. The deep fibers of the coracohumeral ligament make up the fourth layer extending into the supraspinatus and infraspinatus junction laterally. Layer five represents the actual capsular layer of the joint. The ability to recognize the complex layered anatomy in addition to the tear configuration is critical if an anatomic repair is to be achieved. Furthermore, collagen organization is more robust on the bursal aspect of the rotator cuff as compared to articular-sided fibers , a pertinent fact when evaluating partial thickness tears. It is also worth noting that a significant contribution to the vascular environment of the rotator cuff, when considering healing potential, may arise from adjacent subacromial structures including the bursa . Investigators have further refined the insertional anatomy of the rotator cuff components . Each segment of the rotator cuff has a specific “footprint” that can be quantified. This is particularly important when assessing partial thickness cuff tears. The depth of the tear, as judged by the amount of exposed “footprint,” allows the clinician to not only estimate the severity of the tear, but to also choose the most effective treatment . The rotator cuff muscles centralize the humeral head and permit a single center of rotation while providing stability and strength. During active shoulder elevation, the rotator cuff muscles depress the humeral head, allowing efficient elevation of the extremity while the head remains reduced in the glenoid . Studies have been performed evaluating the individual rotator cuff muscles and their respective contribution to shoulder strength. The supraspinatus and infraspinatus provide approximately 45% of abduction strength and the infraspinatus contributes nearly 90% of external rotation power . The supraspinatus and deltoid muscles provide balancing forces in the coronal plane of motion. The importance of balanced force couples cannot be overemphasized, and the goal of surgery, when necessary, should be to properly and anatomically restore these forces such that their counteraction is maintained. Although there has been speculation that the biceps serves as a humeral head depressor and maintains an active role in shoulder function, comparative anatomic studies as well as electromyographic data indicate that the biceps probably does not function as a humeral head depressor , and that the hypertrophy often encountered in the massive rotator cuff tear may be inflammatory in origin as opposed to a reflection of intrinsic strengthening. There is some evidence from EMG studies that the biceps may serve as an additional shoulder stabilizer in those with anterior shoulder instability. Before describing the mechanics of rotator cuff pathology, post-mortem studies provide an interesting backdrop to the issue of etiology. There is little doubt that rotator cuff tearing is a function of age among other factors. Post-mortem studies have indicated an incidence of full or partial thickness tears ranging from 5% to nearly 40%.The prevalence of these partial thickness tears appears to increase with age. Suffice to say that tearing of the rotator cuff as a function of age is clearly a common occurrence. Furthermore, many of these tears, both full thickness and partial, may be clinically silent. As clinicians, we must be cautious in attributing causation to findings detected during diagnostic testing as these results may simply reflect the senescence process without significant clinical sequelae. After a tear is noted, its natural history deserves attention. Several authors have reported on the progression of partial to full thickness tears. There is also evidence that full thickness tears are unable to heal spontaneously although an ineffective healing response may occur . Repeat arthrography revealed that 10% of the tears had presumably healed, 10% had decreased in size while enlargement of tear size occurred in 51%, and 28% progressed to a full thickness tear. A study comparing operative and nonoperative treatment for full-thickness rotator cuff tears concluded that larger rotator cuff tears in older individuals most likely progress in size although they can remain clinically quiescent . The study also concluded that the results of rotator cuff repair are clearly superior to that achieved with nonoperative measures only. When considering the possible causes of rotator cuff disease, mechanical impingement of the rotator cuff is considered the most common recognizable source of recurring pain and disability in the active population. Primary impingement occurs at the anterior one third of the acromion and coracoacromial arch. The mechanical stresses endured by the rotator cuff, as well as its poor vascular design, both dynamic and static, have been well documented . Additional factors influencing rotator cuff pathology include acromial shape , slope, coracoacromial ligament size , postfracture deformity, os acromiale and acromioclavicular joint spurring . Functional abnormalities, such as asynchronous shoulder motion, posterior capsular contractures, scapular dyskinesia, glenohumeral instability, and distant neurological injury leading to weakness can also adversely affect the rotator cuff on a secondary basis with increased impingement forces concentrated in the subacromial space (84,85,86,87). Impingement may occur from a direct mechanical insult, usually the result of an acromial excrescence excoriating the bursal aspect of the rotator cuff (Fig 13-7). However, another plausible injury cascade begins with intrinsic cuff failure, leading to insufficient humeral head depression and subsequent superior migration with creation of a traction spur within the coracoacromial ligament as a secondary phenomenon (24,26,68,71). The cause for intrinsic cuff failure can range from fatigue on an overuse basis to underlying shoulder instability or superior labral pathology, injuries that have been associated with internal impingement and articular sided cuff failure (88,89,90,91,92,93). Regardless of etiology, a narrowed or stenotic supraspinatus outlet poses continued risk to the rotator cuff. Rotator cuff disease, especially that related to the impingement phenomenon, is usually evident from the history alone. A painful range of motion beginning at 70 degrees of forward flexion through 120 degrees is commonplace with pain localizing to the anterior-superior shoulder, often radiating down the lateral upper arm into the deltoid insertion. Overhead activities are the most provocative, and in instances where the rotator cuff has actually torn, night pain and difficulty sleeping are common complaints. Motion is usually not restricted, other than that due to pain; however, for longer standing injuries, a secondary adhesive capsulitis pattern can be encountered, especially in the older population. Most often the onset of pain is insidious and takes place over a longer period of time, but for those with an acute injury, a tearing sensation associated with profound early weakness may be the presenting history. Because rotator cuff disease reflects a spectrum of pathology, the history and physical findings may overlap. There may be little difference in the presentation and findings of patients with isolated impingement, partial and even small full thickness rotator cuff tears. which one can compare. One should survey for atrophy or asymmetry, especially in the supra and infraspinatus fossae. Long-standing rotator cuff tears are often accompanied by significant, visible atrophy. Examination should include assessment of range of motion, both active and passive, observing forward flexion, abduction in the scapular plane, internal rotation, and external rotation both in abduction and with the elbow at the side. Careful evaluation of scapular tracking should be included as poor scapulo-thoracic mechanics can lead to secondary subacromial pathology. In some instances of suspected impingement, simply treating scapular dyskinesia can alleviate secondary subacromial space symptoms . Strength testing should be performed in an attempt to isolate the different components of the rotator cuff to assess weakness. The “lift-off” test can help to assess subscapularis integrity . Although clinically useful, placing the arm in the testing position can be provocative and difficult to achieve, especially in the older population. The “belly-press” test (or Napolean sign) can also help determine integrity of the subscapularis, is less provocative than the “lift-off” test and can actually be quantified to assess partial tears as well .Resisted external rotation with the elbow by the side is useful in detecting tears extending into the infraspinatus . This manual test is critical for assessing the posterior transverse force couple while the “belly-press” test determines subscapularis function. If significant weakness is noted in either or both muscle groups, loss of humeral head containment is imminent if not already present. Loss of the normal distance between the humeral head and acromion should be evident, and one must proceed with great caution if a decompression is undertaken. Violation of the arch in conjunction with inadequate transverse force couples may ultimately lead to erosion of the acromion by the humeral head and subsequent anterior-superior humeral head migration . The impingement sign involves stabilizing the scapula while elevating the shoulder in the scapular plane. Pain elicited in the arc from 70 to 120 degrees is indicative of the impingement phenomenon. Confirmation of this finding in the form of the impingement test consists of complete resolution of pain during the painful arc of motion after an anesthetic has been injected into the subacromial space. A variation of the impingement sign is the Hawkin’s test in which the shoulder is placed in 90 degrees of forward flexion, the elbow is flexed 90 degrees and the shoulder is then internally rotated. Rotation of the greater tuberosity under the arch in this position decreases space for the rotator cuff leading to impingement pain. It is essential that the initial evaluation of the painful shoulder include quality plain radiographs. The standard radiographs should include a true anterior-posterior view with the shoulder in the internal and neutral position, an axillary view, and the outlet (supraspinatus) view, which is used to evaluate and classify acromial morphology and arch anatomy. In addition to establishing morphology, the thickness of the acromion should also be assessed and if surgery is recommended, a pre-operative decision can be made regarding the amount of bone to be resected so as to prevent excessive thinning or inadequate bone resection. The standard anterior-posterior views may show superior migration of the humeral head consistent with a cuff tear and potential subscapularis involvement. Cystic and/or sclerotic change in the greater tuberosity may also signal tendon pathology. The axillary view is most helpful in assessing concomitant glenohumeral degenerative changes, but is most helpful in establishing the presence of an os acromiale. Magnetic resonance imaging is the current test of choice when evaluating the soft tissues of the shoulder . T1 weighted images revealing increased signal in the rotator cuff combined with a focal defect or loss of continuity of the cuff on the T2 weighted image is a common finding when a full or partial-thickness tear is encountered . The addition of a contrast agent such as gadolinium significantly enhances the positive predictive value for diagnosing a full thickness tear, and can also aid in detecting and quantifying partial tears of the cuff as well . Several studies have demonstrated a poor correlation between arthroscopic findings and MRI abnormalities. The combination of fat suppressed images combined with contrast has been reported to significantly improve the sensitivity and specificity for detecting full and partial thickness cuff tears. One must exercise caution when interpreting MR findings because asymptomatic individuals may have significant rotator cuff findings on MRI, but may remain completely asymptomatic . Magnetic resonance imaging continues to demonstrate its greatest utility and potential when combined with a thorough and reliable history and physical examination. Although an MRI scan is not essential for every patient with shoulder pain, for those anticipating a surgical procedure, a pre-operative MRI scan can be helpful for the following reasons: evaluating whether a cuff tear accompanies a suspected impingement syndrome, the presence of which would alter the post-operative regimen, allowing the patient to properly plan for post-operative care; determining the size and potential tear configuration, including retraction, delamination, and thinning, factors that need to be considered in the surgical planning; assessing the presence or absence of atrophy or fatty infiltration, both important prognostic factors; and establishing the presence of co-morbidities such as partial biceps or labral tears. Because rotator cuff pathology can represent as a wide spectrum of disease, there is some utility to compartmentalizing the most common entities in an effort to develop algorithms which guide treatment. The management of impingement with or without associated cuff tearing, partial thickness-tears and full-thickness rotator cuff injuries will be the primary topics of this section. Impingement of the tendinous portion of the rotator cuff as it passes under the coracoacromial arch is a classic cause of rotator cuff injury. When impingement-type symptoms present in a younger population, great care must be taken to avoid over-diagnosing and over-treating as the impingement may be internal or secondary to instability, which effectively moves the cuff closer to the arch. Middle-aged to older patients presenting with impingement symptoms are generally recreational overhand athletes or individuals whose occupation requires repetitive, forceful overhead work. These patients present with chronic, low-level shoulder pain that is exacerbated with overhead activity or motions that necessitate internal rotation of the humerus in the abducted position, such as reaching behind a car seat. The pain usually localizes to the anterosuperior shoulder with radiation into the deltoid insertion region, following the course of the underlying bursa and capsule. Frequently, the primary reason for presenting to the orthopaedic surgeon is sleep disturbance. Treatment of impingement syndrome is patient specific. After the diagnosis has been made, the varying degrees of pathology and patient expectations must be considered. To assist in developing a treatment plan, Neer described the three stages of rotator cuff involvement: Stage 1: reversible edema and inflammation; Stage 2: tendon fibrosis and chronic inflammation, a stage that has been further subcategorized into Type 1 without a cuff tear and Type 2 associated with a partial thickness tear; and Stage 3 complete fiber failure with a full thickness tear. Knowing the status of the rotator cuff is critical in making therapeutic decisions. to proper activity modification, physical therapy exercises can be of great benefit, focusing not only on rehabilitating the rotator cuff musculature, but also on re-establishing a full, pain-free range of motion and normal scapulo-thoracic rhythm and strength. The net effect of a proper rehabilitation program should result in decreased inflammation and thickening in the subacromial space as well as an increase in the interval between the humeral head and acromion. The younger overhand athlete with impingement-type pain should be carefully examined for a functional loss of internal rotation. A tight posterior capsule tends to shift the humeral head in a posterior-superior direction leading to rotator cuff symptoms. By simply stretching the posterior capsule using the “sleeper” stretch , resolution of symptoms can often be achieved in this population of patients. Nonsteroidal anti-inflammatory medication is appropriate to assist in decreasing associated soft tissue swelling while, on occasion, the judicious use of a steroid can be very helpful when introduced into the subacromial space (110). For those who fail conservative care, surgery may be appropriate. Most patients who respond to a nonoperative program will do so within a six-month period (10,48). If surgery is indicated, an MRI may prove useful to determine whether or not there is concomitant significant cuff pathology. If the cuff is intact, a simple subacromial decompression should be performed. If the impingement has resulted in associated cuff tearing, the tear may need to be repaired in addition to the decompression. In the properly selected patient, the results of subacromial decompression have been reliable and durable. Although there are several described surgical techniques for subcromial decompression (115), the “cutting block” approach may be the most reliable with regard to referencing the final result against known anatomic guide-lines . Furthermore, pre-operative planning should include the shape and width of the acromion such that over or under-resection is avoided. Subacromial decompression has become one of the most common procedures performed by the orthopaedist, and although a success rate of nearly 90% has been reported for isolated decompressions, a word of caution is warranted. Failures can and do occur. Authors have reported failure rates ranging from 5% to 40% (118,119,120). Despite appropriate treatment, complications and unsatisfactory results can occur . When a failed acromioplasty is encountered, it is incumbent upon the treating surgeon to invoke a systematic, thorough analysis of the failed acromioplasty. The work-up should attempt to answer the follow questions: Was the initial diagnosis correct? Was the appropriate operation chosen? Was the procedure performed technically correctly? Was associated pathology recognized? Was the postoperative rehabilitation timely and appropriate? As these questions are answered during the re-evaluation, the cause for failure can be established and categorized as initial diagnostic error, treatment failure, or a complication of treatment, and then appropriately treated. Individuals with shoulder instability or other underlying pathology can develop significant abnormal mechanics that can lead to rotator cuff functional disability, eventual fatigue and loss of humeral head containment. When this occurs, rather than the coracoacromial arch moving toward the cuff, the cuff migrates cephalad as containment is compromised. In addition to articular-sided internal impingement-type rotator cuff tearing, secondary changes, including traction spurring of the CA ligament and abrasive changes of the bursal aspect of the cuff can be encountered. Several investigators have described partial articular-sided rotator cuff tears resulting from internal impingement . This entity represents contact between the undersurface of the cuff and the posterior-superior glenoid and labrum. There exist a plethora of potential causes for internal impingement including physiologic to pathologic change from repetitive intra-articular contact, torsional forces created by loss of humeral head retroversion, ligamentous insufficiency and abnormal mechanics, especially with regard to scapular dyskinesia. These patients are younger, and often complain of pain localizing to the posterior shoulder. They also complain of early fatigue and loss of control in the throwing motion. Fatigue of the dynamic stabilizers and excessive external rotation secondary to overstretching of the anterior capsule may predispose individuals to development of internal impingement. A subset of patients, usually baseball pitchers, develop a glenohumeral internal rotation deficit (GIRD syndrome) with a significant loss of internal rotation on the affected side. This contracture initiates a cascade of kinematic abnormalities that can result in increased torsional strain within the cuff, labral abnormalities and tertiary capsular insufficiency, all implicated in the secondary articular-sided partial cuff tears. In later stages, the ability to discriminate between primary and secondary impingement may be challenging. Even if a primary instability is present and treatment is directed toward correcting the primary pathology, consideration of subacromial debridement up to and including bony resection must be considered as part of the overall treatment regimen if changes such as bursal-sided cuff tearing and fraying of the coaracoacromial ligament are witnessed. The real challenge for the clinician is to carefully evaluate these patients to assign the correct diagnosis before proceeding with surgical treatment. Performing a subacromial decompression without treating instability in those with underlying symptomatic shoulder laxity can serve to worsen the degree of instability. Partial thickness rotator cuff tears can result from intrinsic cuff degeneration and tendinopathy absent an injury or impingement. The lack of uniformity of collagen bundles and the paucity of vascular supply contributes to weakness, especially along the articular aspect of the rotator cuff . These degenerative tears often exit the articular surface and can be well visualized at surgery, but sometimes can be entirely contained within the cuff (intrasubstance), and therefore easily missed. As noted earlier, extrinsic impingement due to narrowing of the supraspinatus outlet can result in chronic cuff abrasion leading to a partial cuff tear. Histological changes consistent with trauma have been found on the undersurface of cadaveric acromion specimens with bursal surface tears but not in those with articular surface tears . This suggests that bursal-surface tears may be more likely to be related to abrasion of the cuff by the acromion. Furthermore, extrinsic impingement due to coracoacromial arch narrowing has been postulated to cause partial tears on the articular side as well as the bursal surface of the cuff based on transmural shear stress leading to fiber failure of the laminated cuff. Trauma, absent impingement, can cause a partial thickness tear, usually leading to a partial avulsion of the articular surface of the cuff. This can be the result of repetitive microtrauma or simply a single high-energy episode. This type of avulsion injury has been named the “PASTA” lesion (partial articular sided tendon avulsion). There is currently no universally accepted classification system for partial thickness rotator cuff tears. Evaluating the results of treatment has been challenging due to this lack of conformity. Anatomic knowledge of the “footprint” makes this assessment more uniform and reproducible. If the average supraspinatus “footprint” is approximately 12 mm in size, it is possible to grade the percentage of tearing. Using the “footprint” as a guide, if more than 6 mm of the footprint is exposed, a greater than 50% tear of the supraspinatus insertion has occurred. Individuals with a suspected partial tear due to extrinsic impingement or intrinsic tendinopathy are treated in a similar fashion as those with impingement syndrome. Subacromial bursal inflammation is controlled with activity modification, nonsteroidal anti-inflammatory medication, and the judicious use of injectable corticosteroids. The role of rehabilitation to restore normal joint mechanics and strengthen the rotator cuff and parascapular musculature has been proposed to reduce the progression of rotator cuff disease in those with both external and internal impingement. The role of the external rotators which act as humeral head depressors may play a role in reducing external impingement thus reducing further mechanical impingement of the cuff from the coracoacromial arch. Arthroscopic debridement alone of partial tears has led to mixed results. One study evaluating the results for decompression alone recorded failure rates exceeding 50%. Furthermore treating a partial tear without addressing potential underlying causes such as instability has also been associated with a high failure rate. Arthroscopic subacromial decompression combined with arthroscopic debridement of partial tears has also led to mixed results. Several investigators have described failure rates ranging from 20 to 30% in this treatment group. Because of concerns about cuff integrity and tear progression, repair of extensive partial rotator cuff tears has been recommended . Bursal-sided partial tears of the rotator cuff are usually a direct result of mechanical impingement occurring at the arch. These injuries are readily visualized at surgery and the depth of the tear can be accurately estimated in most cases. For those with a Grade I or II partial tear in conjunction with impingement, a simple debridement in association with a subacromial decompression may be the most appropriate treatment. For those individuals who have a significant partial tear, Grade III, and higher post-operative expectations of their shoulder, a more aggressive approach including repair of the partial tear in addition to the decompression may be more suitable. The articular-sided tears occur two to three times more commonly than bursal-sided tears, and may not necessarily be associated with the impingement phenomenon. Repetitive traction forces or underlying primary pathology such as a superior labral injury or symptomatic capsular redundancy can result in articular-sided cuff tears. Additionally in some instances, internal impingement may be the source of the tearing. The GIRD syndrome (glenohumeral internal rotation deficit) has been established as a common pathway for articular-sided partial rotator cuff injuries. Loss of internal rotation leads to abnormal joint mechanics with subsequent loss of the normal cam effect on the glenohumeral joint. This permits pathologic hyper-external rotation, superior labral pathology and cuff tearing on a tensile failure basis. Others have postulated a direct contact lesion occurring between the articular surface of the cuff and the posterior-superior glenoid and labrum . Grade I and II articular-sided partial thickness tears should be debrided. Careful consideration to an underlying primary pathology, especially instability, must be given, and if discovered, treated concomitantly. A Grade III articular-sided partial tear deserves a repair, either trans-tendon or by completing the tear and converting to a full thickness lesion. Whether a decompression is warranted or not should be determined by the presence or absence of subacromial changes. Those lacking pathologic changes in the subacromial space such as coacoacromial ligament fraying should not be treated with a decompression as further instability is potentially incurred. This method seeks to replace the partially torn tendon to its native “footprint” on the tuberosity, preserving the remaining fiber attachment. It is an alternative technique to the arthroscopic approach championed by Weber (137) in which the tear is first converted to a full-thickness injury and then repaired arthroscopically. It is important to understand that not all full thickness rotator cuff tears are alike, and that some complete tears are compatible with excellent function and minimal discomfort. Armed with biomechanical models, basic engineering principles, and kinematic studies of patients with known rotator cuff tears. A biomechanically functioning torn rotator cuff must spare a portion of the infraspinatus as well as the subscapularis. Alterations in this relationship can cause the centroid to move superiorly, thereby allowing the humeral head to translate superiorly and limiting shoulder elevation and normal kinematics. Irreversible changes include fatty infiltration, muscle atrophy, degenerative joint disease, and morphologic changes to the cuff including retraction and thinning. These irreversible changes in turn reflect the pre-operative risk factors portending a poorer outcome including larger tears, delay in treatment, and advanced age. The size of the tear, degree of retraction, the presence or absence of fatty infiltration or atrophy, patient age, and activity level help the clinician determine the appropriate category, and then decisions can be made regarding the duration of nonsurgical management versus early surgical intervention. If a small tear can progress during the course of nonsurgical management but the results of treatment are not jeopardized, a prolonged conservative course may be worthwhile without posing a significant risk to the final outcome. As noted earlier, the clinical presentation of a full-thickness rotator cuff tear can mimic findings consistent with simple impingement or with a partial thickness tear. The most common physical finding that distinguishes those with full thickness tears from impingement is weakness upon stress testing. Although weakness may be an indication of inhibitory pain, the Neer test can help document actual tendon weakness. After pain is relieved with the subacromial injection, significant weakness on stress testing is indicative of a full thickness injury. Often in those with large, chronic tears, visible atrophy within the supraspinatus and infraspinatus fossa may be present. Smaller tears are easily missed as patients present with findings and symptoms consistent with impingement. Occasionally weakness is present, but even following the Neer test, significant weakness may not be detected. These tears usually involve the supraspinatus tendon insertion, and pain is the primary presenting complaint. Examination usually reveals normal motion and strength. After the diagnosis has been confirmed, usually by MR testing, definitive treatment can be individualized. Several authors have shown that small tears treated with decompression alone can achieve significant pain relief while maintaining good function. In an older patient unable or unwilling to undergo the more arduous rehabilitation associated with a full thickness repair, the simple decompression alternative is a realistic one. In the younger, more active population, obvious concern regarding propagation of the tear is a legitimate one. For those individuals, a decompression in conjunction with a repair is the treatment of choice. Although the open acromioplasty and rotator cuff repair technique has been associated with a high success rate, the technique has been supplanted by the arthroscopically assisted mini-open and the all-arthroscopic techniques . Several studies have validated these two newer approaches with success rates equal to those achieved through an incision alone . Furthermore, the mini-open and all-arthroscopic techniques have demonstrated little or no difference when compared in clinical studies . The all-arthroscopic approach relies on meticulous technique and a well-patterned step-wise approach to a successful outcome. Arthroscopy is particularly helpful in allowing a panoramic view of the torn rotator cuff. After the tear pattern is recognized, an anatomic repair can be achieved. The goal of rotator cuff surgery is to achieve an anatomic repair in which the tendon is stressed appropriately and can function as originally intended. Using standard anterior, posterior, and lateral portals, the tear is identified and the tear pattern recognized. Small tears are generally crescentic in nature with minimal retraction due to their small size. Associated pathology is identified such as biceps fraying or tearing, and treated. A subacromial decompression is accomplished if there are findings of impingement such as coracoacromial ligament fraying. The actual rotator cuff repair begins with mobilization of the cuff, if necessary, and using a grasper to reapproximate the torn edge of the cuff back to the greater tuberosity. Simply mobilizing the cuff tendon in larger, retracted tears from a medial to lateral position and re-attaching to bone is usually an oversimplified approach and one that usually leads to structural failure. Chronic tears often have a specific pattern of retraction, and diagonal reduction maneuvers recreate the original anatomic attachment. The bony bed of the greater tuberosity can be prepared with the shaver blade or a curette in an attempt to minimize bone loss and to maximize the pullout strength of the implants. The suture anchors are placed 5 to 7 mm from the articular margin and are separated by at least 1 cm . The insertion angle approximates 45 degrees from the long axis of the humerus to maximize pull-out characteristics. There exists a multitude of implant devices intended for rotator cuff repair, and for all, satisfactory bone purchase is essential. After the anchors are inserted, the sutures must be either ante- or retrograded through the free edge of the torn tendon . Numerous ingenious instruments and devices are available to assist the surgeon in accomplishing this portion of the procedure. Several accessory portals are also available which can facilitate retrograde suturing of the rotator cuff. After the sutures have been passed, careful, meticulous knot-tying is required during which both knot and loop security must be maintained, loop security referring to the tension with the suture itself as it passes through tissue. The final result should consist of an anatomic repair with excellent coaptation of tissue to the bony bed . As the shoulder is ranged, no undue tension on the repair site should be present. Satisfactory clearance in the subacromial space should be verified as well. When larger tears are encountered, the option of a simple decompression becomes less compelling. Some authors have described satisfactory early results with this approach only to discover progressive deterioration, especially in the larger tears . Although the possibility of an isolated decompression in a low demand individual with limited goals remains an option, patients with sizeable tears are more likely to benefit from a formal repair of the torn tendon. For those chronically retracted L-shaped tears with an anterior extension, an interval release (147,159) that divides the coracohumeral ligament can be very effective in gaining length and satisfactory mobilization such that an anatomic repair can be performed consisting of a side to side repair followed by tendon to bone . This same approach can be utilized for those L-shaped tears that exhibit a posterior extension with a diagonal retraction pattern. These tears usually exceed 4 to 5 cm in dimension, but can be deceiving. Clearly a tear retracted in a lateral to medial direction of 5 cm presents as a very challenging repair whereas a tear extending 5 cm in an anterior to posterior direction without significant retraction is a much easier surgical problem to solve. In general, massive tears refer to those chronic, retracted tears that are usually accompanied by fatty infiltration, muscle belly atrophy as well as thinning and scarring of the torn end of the rotator cuff. The approach to these massive, retracted tears can be difficult, and requires that the clinician gather as much information as possible before embarking on a therapeutic course. These patients often present with pain as their overwhelming symptom, and on examination can exhibit significant motion restriction. Not uncommonly, if motion is restored with a well-supervised physical therapy program, the pain can be significantly reduced. If functioning force couples are in effect, restoration of motion may be all that is required to attain a satisfactory result without surgery. For those with significant strength deficits, the prospect of a repair has to be considered. Certainly concomitant fatty infiltration and muscle atrophy are poor prognostic factors, and patients must be counseled accordingly. Achieving re-attachment of the rotator cuff may not result in significant functional improvement if the rotator cuff is significantly diseased in advance of surgery. Simple debridement and acromial “contouring” have been described as salvage-type procedures that may palliate some of the pain ; however, the risk of violating the coracoacromial arch and of losing anterior-superior head containment must be carefully considered before embarking on a debridement-only approach. Clearly, if such an approach is selected, minimizing bone resection is of utmost importance. If the rotator cuff cannot keep the humeral head centered, the coracoacromial arch becomes a fulcrum for shoulder elevation. If the arch is violated and an aggressive bone resection is performed, the humeral head can erode through what remains of the acromion . When a complete repair of a massive tear is not technically feasible, consideration of a partial repair must be entertained. Restoring balanced force couples in a massive tear may provide enough stability for a functional outcome. Understanding the anatomy, biology, and pathoanatomy of the rotator cuff is of utmost importance if skilled treatment of rotator cuff injuries is the objective. Recognizing the spectrum of disease and the various etiologies takes effort and experience. After the injury is understood, the pathoanatomy well-visualized, and the patient’s specific needs acknowledged, treatment of the rotator cuff injury can be well-formulated with every expectation of a satisfactory outcome for both patient and surgeon.